"Doughnuts? Smithers, you know I don't like ethnic foods." 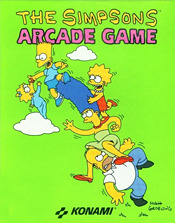 I think the developers of this game got a small pamphlet that described the Simpsons franchise. Beating up zombies almost makes sense compared to everything else. The developers stopped trying to make sense. Nobody noticed. Hey I drew some ninjas and robots, can we put them in the game?